Hat durchaus seine experimentellen Anteile - dann kommt der Chorus, und versaut es durch Schweinerock - SING IT FOR THE GIRLS, SING IT FOR THE BOYS ... ansonsten weniger überraschend. Dieser Song als zweite Single, naja. <br>Gefällt mir allgemein nicht unbedingt. Great music video and the song has grown on me moving it up to a 4 star.<br><br>5 weeks in the UK top 100. <br><br>UK#50.<br>Latvia#29. <br><br>US#58.<br><br>14,900 copies sold in the UK.<br><br>Their eighth biggest selling single in the UK. Still really like this one. I'm generally a sucker for that sort of drum beat, and this one builds very nicely. Okay. Second listen better than the first. ▒ De echte fans komen met deze plaat van "My Chemical Romance" uit begin oktober 2010, volledig aan hun trekken !!! De neutrale luisteraar toch wat minder ☺!!! Not too bad, about on par with Na Na Na. A definite step-up from the previous single. Besonders in den Strophen sehr athmosphärischer Radiotitel, knappe 5*. het heeft wel wat, maar het refrein is toch iets te rommelig naar mijn mening. Ach wat!... Laat ik niet moeilijk doen! Beste een aardige product! Toch blijft de teller bij 3 steken. Great song, much better than Na Na Na. toch wel 1 van hun minste platen al was hun vorige ook niet goed. It's run on ARIA really affected it's performance on my personal chart, had it been a bigger hit on ARIA it would certainly been a #1 on my personal. Hopefully it doesn't effect it too much come the year end chart.<br><br>Peaked at #4 on my personal chart.<br><br>Came in at #95 on my TOP 200 OF 2011. 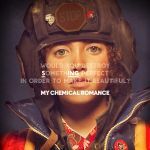 A sensational song from My Chemical Romance, which may rate higher than another fave of mines from them (Welcome To The Black Parade)<br><br>Ranked #6 on my end of year best songs of 2010. Refrain sehr gut!<br>Der Rest ganz okay..
Den mehrheitlichen 4ern kann man sich anschließen. I really like this one, even more than I recall ever liking it. Quite possibly my favourite from My Chemical Romance.